while working with microcontrollers it is often required to communicate with the computer or other piece of hardware. since nearly all uCs have USART it is a natural choice. the bad news is that RS-232 uses voltages way beyond typical +5V. thus, before connecting to the PC, level conversions need to be done. this is not all - nowadays it is very uncommon for a PC to even have RS-232 port! on the other hand USB is widespread. the key of this nano-project is to enable easy communications with the uC, that operates on +5V USART, to talk with computer via USB. there is a nice chip that provides USART to USB conversion, that is 100% USB compatible and does not require any extra hardware parts, nor software on uC side. may i introduce, the hero of this article - FT232. :) the board itself is trivial - one connects USB on the one and and GND, RX, TX, RTS, CTS on the other. for many applications it is just enough to short wire RTS with CTS (no flow control). though device is simple, it is very useful when debug communication is required fast. 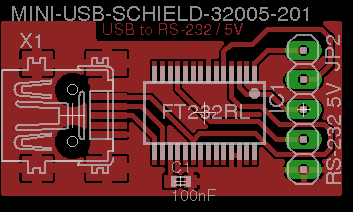 board schematics and PCB layout can be obtained via USB2TTLRS project on github. there are recent releases available via tags as well. license is revised BSD - feel free to do whatever you want with it.